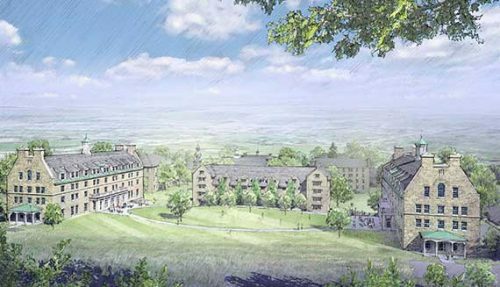 This spring, Colgate University is beginning new construction designed to enhance the student experience in two key areas: the residential living-learning environment and career development. February 1, construction began on Benton Hall, the new home of Colgate’s comprehensive career development program. Nestled just below McGregory and Olin halls, with welcoming entrances from both the Academic Quad and Oak Drive, Benton Hall will house the Center for Career Services and the Office of National Fellowships and Scholarships. The building, which is slated to open in June of 2018, takes design cues from several classic campus buildings. 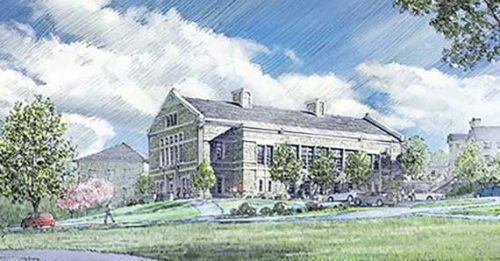 Named for Colgate Trustee Daniel C. Benton ’80, P’10, H’10, it will feature a gracious reception area; advising, employer relations, and interview suites; a flexible “career commons” room for large meetings and lectures; a seminar room; and administrative offices. Rendering of Benton Hall, viewed from Oak Drive. Credit: Robert A.M. Stern Architects, LLP. Two new residence halls will become spaces for collaboration, intellectual exploration, and student-faculty engagement. 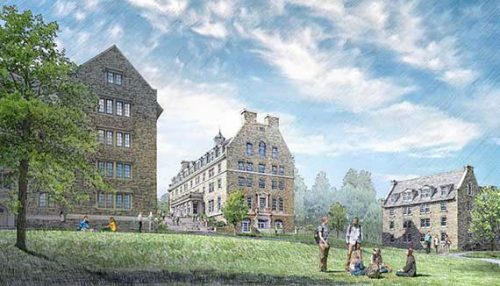 Rising behind Stillman and Andrews halls on the upper campus, and constructed of native stone, the new halls’ exteriors will reflect Colgate’s historic architectural vernacular, and their placement will create an additional gathering quadrangle. Each 100-bed facility will feature three upper floors of double rooms, four-resident suites, and study lounges. Rendering of two new planned residence halls, left and right (flanking Andrews Hall); view from the hill above campus. Credit: Robert A.M. Stern Architects, LLP. View from residential quad of one of two new planned residence halls. Andrews Hall is to the left, Stillman Hall to the right. Credit: Robert A.M. Stern Architects, LLP. The first floors and ground levels will be dedicated to seminar rooms, classrooms, offices, and social lounges. In combination with significant investments to renovate and reconfigure several other campus residence halls, the new structures are part of Colgate’s efforts to enhance student life by ensuring that the space in which students live also support community and intellectual engagement. Construction will begin in April, weather permitting, and should be complete in time for move-in day in 2019. Both projects have been designed by the world-renowned firm of Robert A. M. Stern Architects adhering to LEED Silver sustainability standards.